A well-known automotive company, IPD was established in 1963. 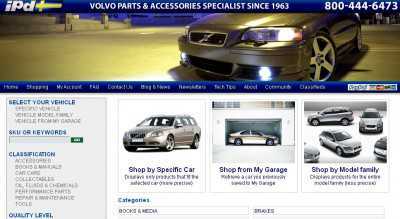 It specializes in Volvo parts, and you can easily search its catalog and buy whatever you want online at www.ipdusa.com. To start shopping, you just have to specify what car you own in order to see all the products that go with it. And you can save your car to your own virtual garage, so that the next time you decide to shop for parts online everything would be done much faster. Alternatively, you can view parts and accessories not just for your vehicle, but for its entire model family. This is obviously less specific, but it can be your only bet when you need something that’s not on stock, and a part for another car within the same model family would do. In any case, products are grouped in the following eight categories: “Accessories”, “Books & Manuals”, “Car Care”, “Collectables”, “Oil, Fluid & Chemicals”, “Performance Parts”, “Repair & Maintenance” and “Tools”. And it goes without saying that you can actually shop for parts and accessories by brand. Plus, you can pick the quality level of what you’re buying. Four different levels are provided: “Best”, “Better”, “Good” and “Rebuilt”. In general, parts that are “good” are these that come from an aftermarket, and the ones that are “better” are original equipment. 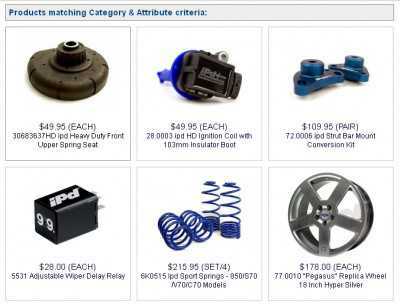 And the site also has a section where people like you and me can post their own classifieds, so that the chances of finding rare parts and accessories on Ipdusa.com are more than doubled.